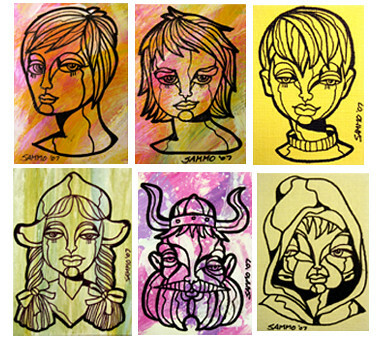 Fine art, Illustration, graphic design and the art philanthropy of Sam Morrison: My ACEO Cards Now on ebay! Over the last year or so I've experimented with creating ACEO cards. For those who may not know what ACEO cards are, ACEOs are known as Art Card Editions and Originals. These 2.5" x 3.5" cards are also referred to as Artist Trading Cards (ATC). 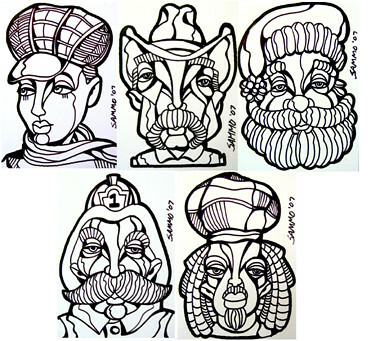 These Small Format Art (SFA) pieces are created in a wide variety of media. For many they are extremely fun and affordable to collect. Anyway, I include them, from time to time, in my art trade packages. They've always been well received, so I thought I'd start posting small batches of them on ebay. Below is a link to my current items up for bid. To check out the wide variety of ACEO cards available by other artists do a simple word search through ebay. There's a lot of artists doing some amazing work.